Hiring a wedding planner to assist you with the planning of your special day is a great decision. Wedding planners can give you great advice, provide you with tools to budget and plan properly, connect you with great local vendors and make everything wedding-related go much more smoothly overall. But your wedding planner in Northwest Indiana is not a superhero; they can’t and won’t do everything that’s related to your wedding. You and your spouse will still need to be at the forefront of planning your wedding, but you’ll have your wedding planner’s advice to guide you. When you hire a wedding planner or have the option to use one that is provided by your wedding venue, here is what you can expect from them. To start, you’ll want to sit down with your wedding planner and discuss your budget, ideas for the wedding, your style and anything else that is pertinent to your wedding day. This will give your wedding planner the chance to get to know you and your tastes, and you’ll become more familiar and comfortable working with them. This is also the point where you can discuss what types of services your wedding planner will offer during the planning process. Not all wedding planners offer the same exact services, so it’s important to discuss these things ahead of time and make sure everything is clear from the get-go. Your wedding planner in Northwest Indiana will likely help you create a timeline that involves all of the things that need to happen between now and your wedding day. They can give you expert advice on when the best time is to have vendor contracts finalized, when to send save-the-dates and invitations and more. They can also help you create a wedding-day timeline and checklist to make sure everything goes smoothly when the big day arrives. Your wedding planner can help you stay within your budget and make sure to recommend vendors and wedding options that will save you money while still giving you the wedding day of your dreams. They can be as involved as you’d like them to be, meaning they might just provide you with a template so you can track your budget on your own, or they might create a comprehensive budget plan for you that goes into detail about where all of your money is going. The services your wedding planner provides on the day of your wedding will vary, but often, the wedding planner will be at your event to take care of the details so you can get ready and enjoy your day in peace. This might mean handling setup and takedown, telling vendors where to go and helping them set up and making sure that the bridal party and all important people are ready when the ceremony is starting. Signature Banquets provides an expert in-house wedding planner when you choose us for your wedding venue! 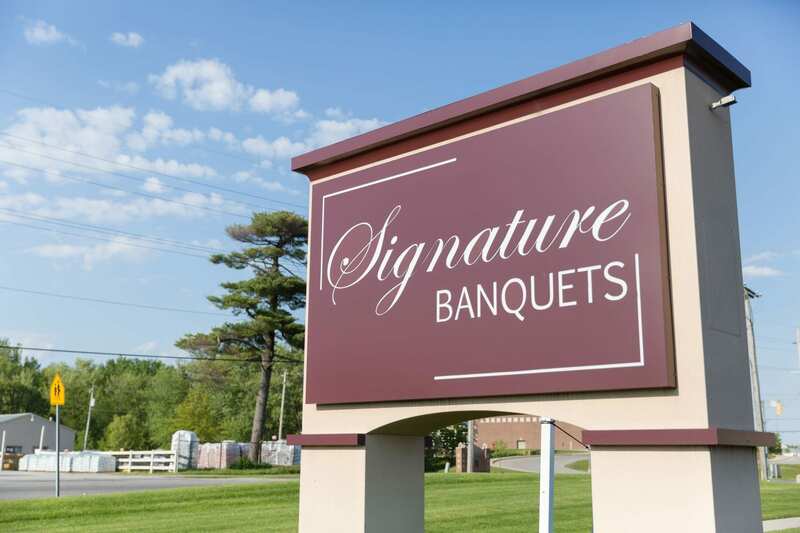 We specialize in hosting and planning special events and weddings in our first-class banquet facility. Take full advantage of our 9,000 square-foot banquet hall and outdoor patio areas for your event, as well as our in-house catering staff and event planners! Call us today to set up your free consultation. Let us know anything else you'd like for us to know. You may also list a few times and dates you are available for an in-person consultation.